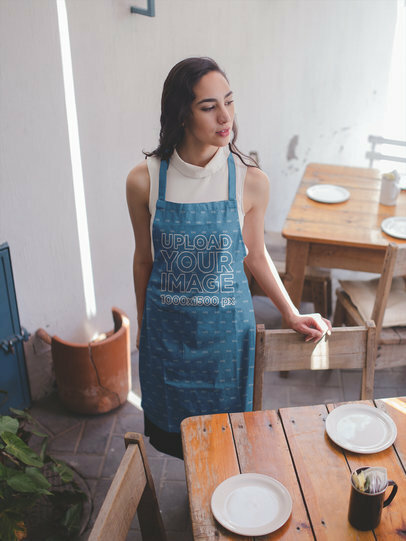 Want to see how your restaurant's apron design look like on an actual model? 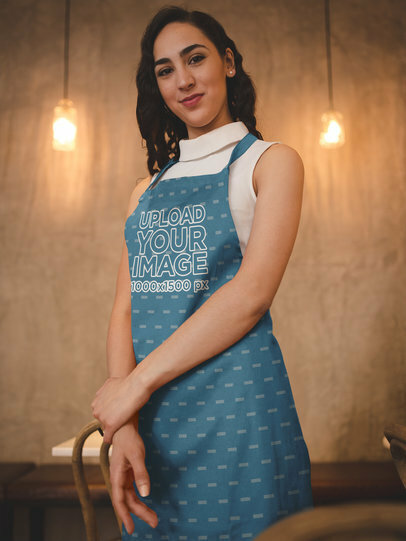 Use Placeit's apron mockups! 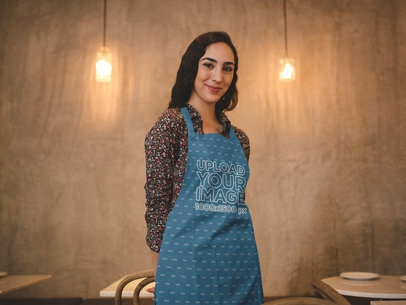 This mockup features a beautiful young woman in a restaurant. All our mockups are trendy, professional, and easy to use. 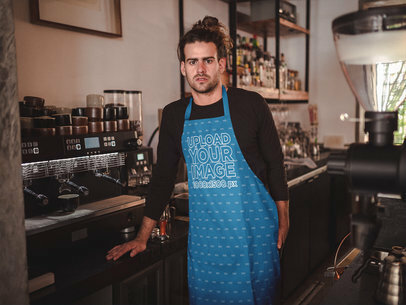 You can even change the apron's color. Try it out, it's easy! 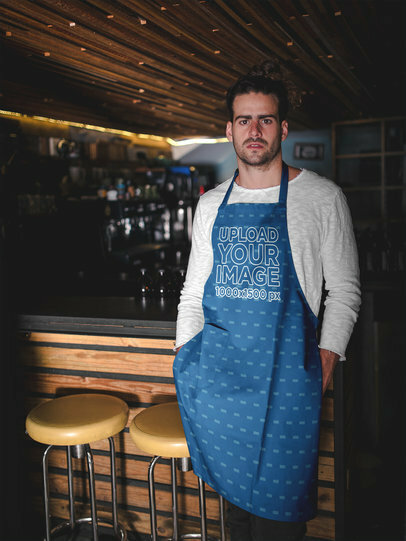 Find at Placeit the mockups you need for you POD shop, even a custom apron mockup! 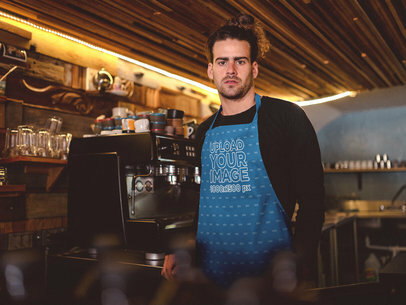 This mockup is perfect to showcase creative apron designs for coffee shops, restaurants and more. It's time to show your clients how professional your designs can look. 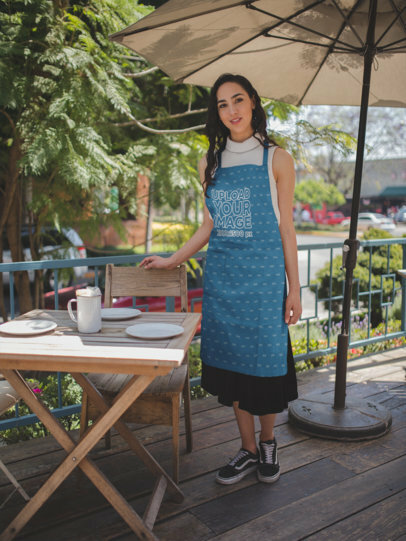 Try out as many apron design ideas as you want! 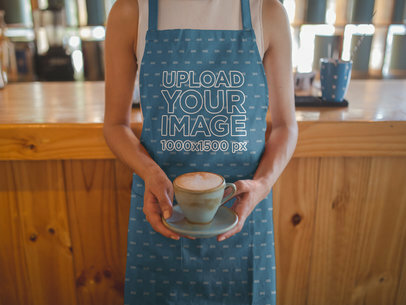 Use this apron mockup to promote your apron designs! 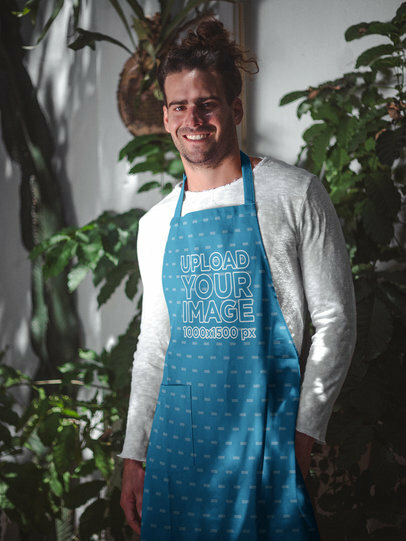 Placeit's apron mockups are incredibly easy to use and can even have the apron's color changed. 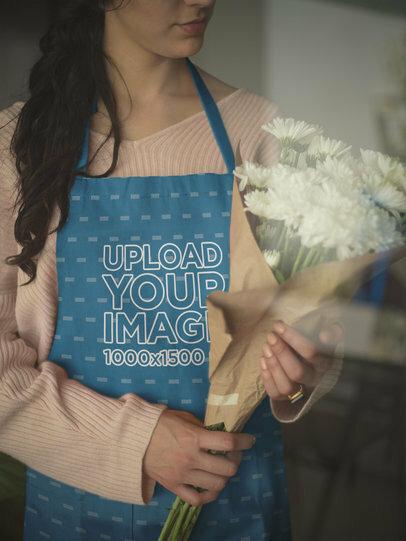 Make the image your own and start promoting your apron designs. It's super cool. Try it out now! 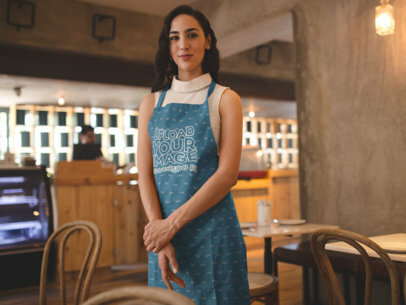 A woman stands in the middle of a dining room. She is wearing a black shirt with floral designs on it. 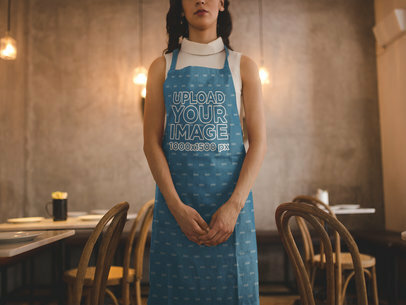 On top of that, she is wearing an apron with white letters that say "Upload Your Image". There are tables and chairs all around her in a light brown color. There are three simple light fixtures hanging from the ceiling. The walls behind her are gray. 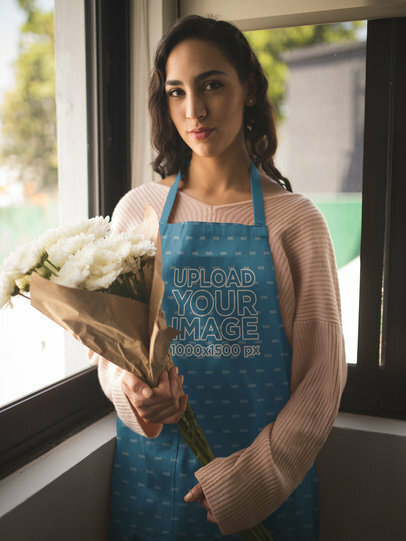 Own a flower shop? 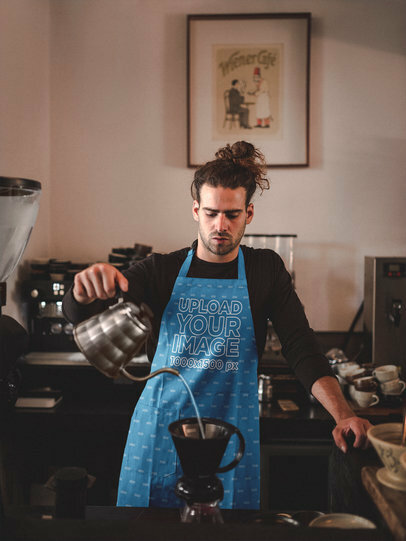 Did you make a cool design for your aprons? 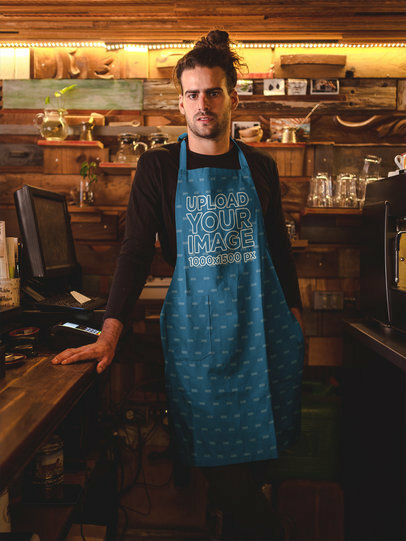 Show them off with Placeit's apron mockups. Our mockups are super easy to use and don't require any additional software. 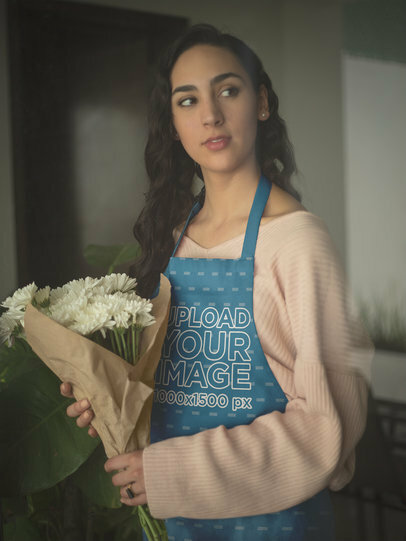 This mockup features a woman holding a bouquet of flowers. Super cute, right? 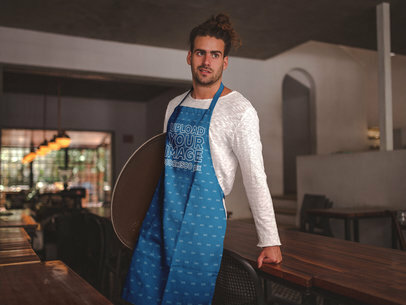 You can even edit the apron color. 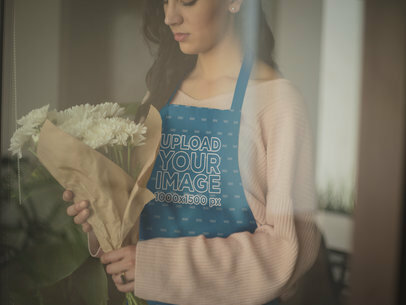 Edit your apron mockup now! A woman stands against a wall. She has full lips, dark brown hair, and brown eyes. An earring is visible in her left ear. She is wearing a pink sweater. 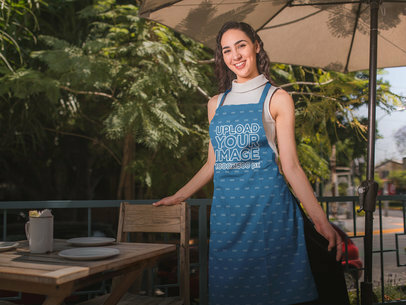 She has an apron over it. 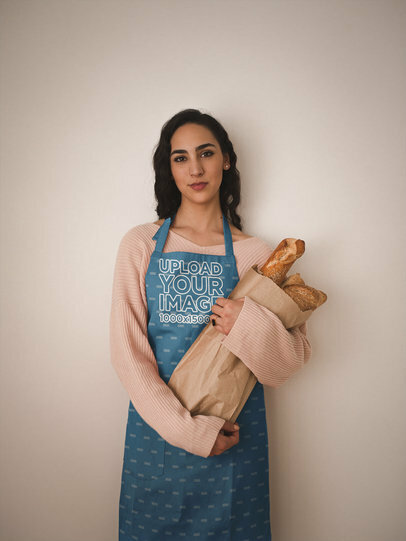 She is holding a brown bag, and there are pieces of bread sticking out of the bag. She is wearing a ring on her left hand. 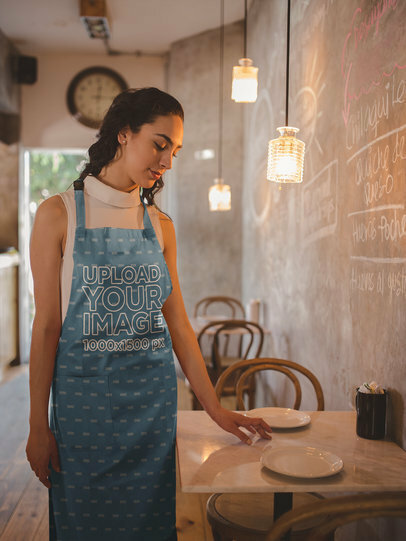 Whether you are starting your restaurant business or you design custom restaurant uniforms, this apron mockup is perfect to showcase your designs in a real-life scene. 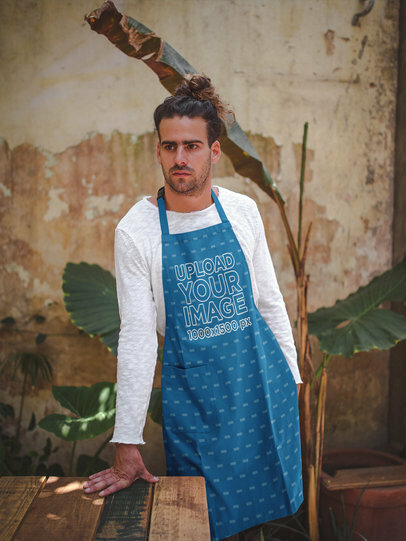 You can try different background colors to display your apron design ideas in the best way! Try it out! 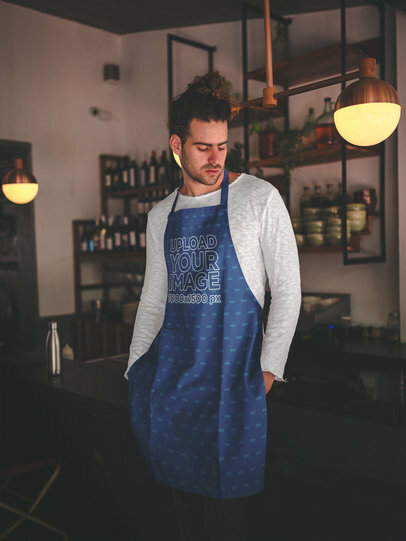 Did you make a design for your restaurant's aprons? Want to display them on an actual model? 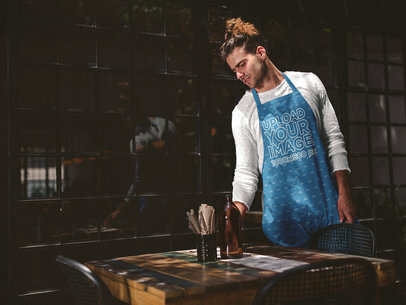 Use our apron mockups and make the image your own. This one features a woman holding a latte in her hands. 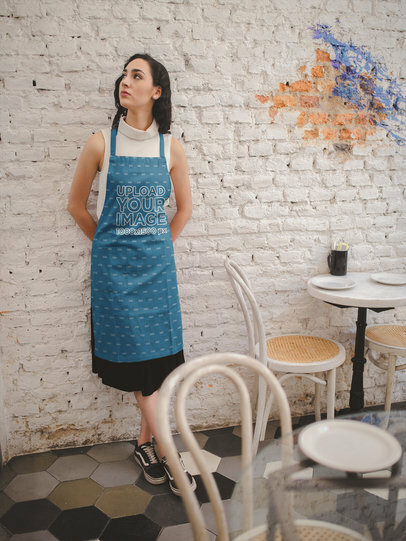 Your design will be front and center, and you can also change the apron color to your liking. Try it out, it's easy! 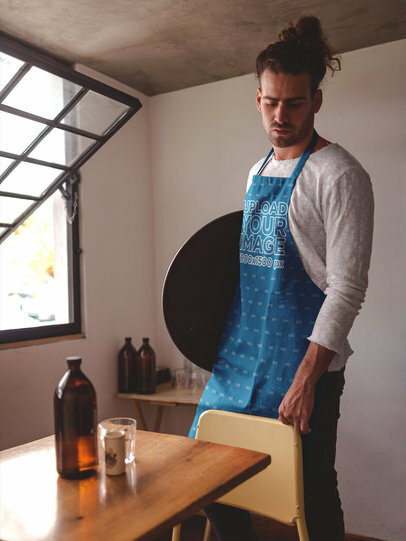 Try out this mockup for custom aprons. 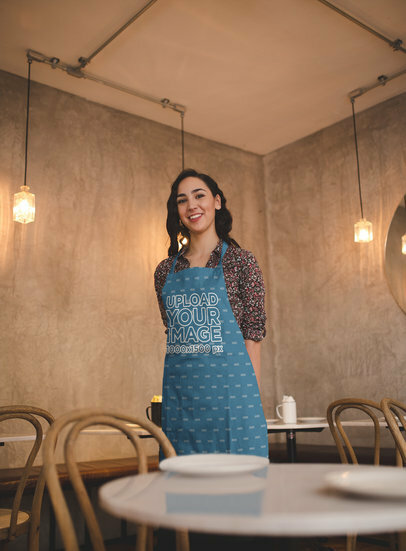 You can showcase your latest designs in a restaurant scene with a beautiful female model. 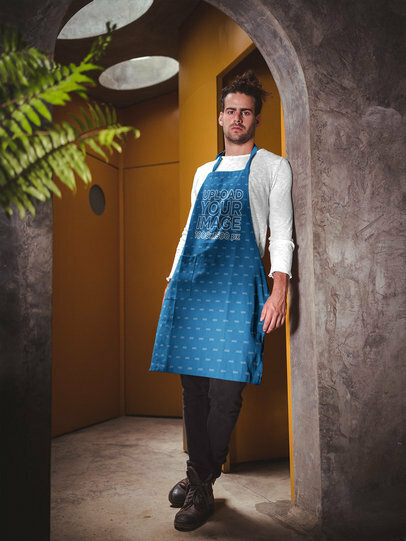 This is a great option to give your clients the final look of your apron designs! 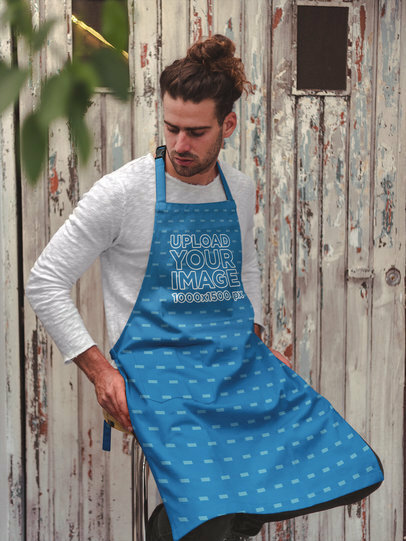 Make Placeit's clothing mockups the latest addition to your visual marketing campaign today and start appealing to your specific target market at a glance! 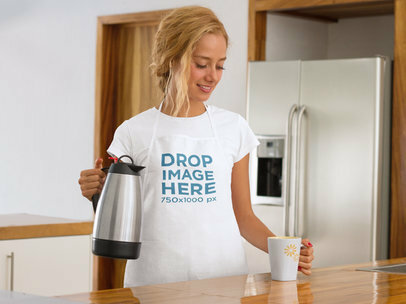 This apron mockup features a young woman at home pouring herself a cup of hot coffee. Don't you think this is a great mockup that could easily appeal to your consumers? If you do, then waste no more time and customize it right away! 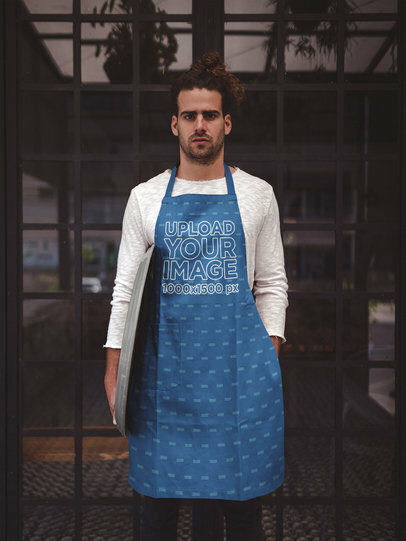 To customize this apron mockup just simply drag and drop an image featuring one of your designs onto the template and in no longer than a couple of minutes, Placeit will deliver a compelling image ready to used as part of your visual campaign. 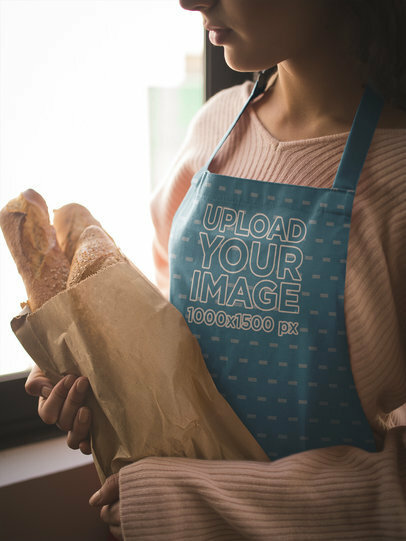 It might be time for you to start advertising your designs in an up-to-date way and believe us when we say that there's no better way for you to achieve this than by starting to use clothing mockup from Placeit! To see more Clothing Mockups click here!